Overview In Hammer Studios' vivid 1959 Technicolor reincarnation of The Mummy, screen horror icon Christopher Lee wraps on the moldy gauze bandages and emerges as the tormented Kharis, an avenger stalking the hills and bogs of Victorian England to track down archaeologist John Banning (Peter Cushing) and other desecrators of his beloved Princess Ananka's Egyptian tomb. "Lee looks tremendous, smashing his way through doorways and erupting from green, dreamlike quagmires in really awe-inspiring, fashion" (David Pirie, Time Out Film Guide). 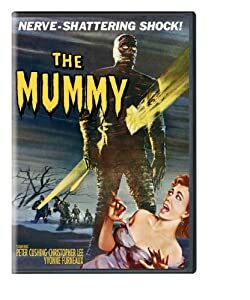 Awe-inspiring, too, was the box-office success of this third Hammer reinvigoration – after The Curse of Frankenstein and Horror of Dracula – of a classic screen monster. My thoughts Anytime you put on a Hammer movie with their two greats, Michael Ripper and George Woodbridge, you know you're in for a treat. And this one also got some fellows by the name of Cushing and Lee. I remember well the first time I saw this film in the cinema. That iconic poster (same art as the DVD cover) sure looked promising. I was a little bit disappointed that the mummy didn't actually walk around with a great gaping hole in his body, though. But apart from that, I loved it. Seeing it again this many years later, I'm a bit surprised how obvious it is that "Egypt" is really a studio set. I guess I'm not quite as easily fooled any more. Not that I think that I actually ever believed that they had gone to Egypt to film. Just as in The Curse of Frankenstein, Christopher Lee doesn't get to speak as the monster. He does speak, however, in the flashback as Kharis before he gets mummified. Actually, you never see him getting mummified. He's just wrapped in gauze and made to stand in a hidden compartment in the tomb. I'm not sure how that kept him from decaying. Must be some kind of magic. Or - a curse? It's said that Kharis is put there to guard the tomb. But in order to wake him one has to read from the scroll of life. That doesn't seem to be a very effective way of guarding. What if the people opening the tomb just took the scroll and didn't read it out loud...? Well, I guess you shouldn't look for too much logic in a film like this. But all that means nothing. The film has all the Hammer style you've come to expect from the early Hammer horror films. And Cushing and Lee are great as always. Not to mention... (so I won't, again). A strong 4 out of 5. I just watched The Mummy friday. What a hoot. It had been a long long time since I had last seen it but like all Hammer Films it has a unique feel to it. Like a Farrlley Brother's film or Coen Brothers film, "Hammer" films are indelibly stamped by production house. like all Hammer Films it has a unique feel to it. Well, I'd say all Hammer films made at Bray. I think Hammer left part of its soul when they moved away from there. I do agree that Peter Cushing was a great talent. He'd be 100 years old if he was still with us, so he probably wouldn't be working much. But Christopher Lee is 91 and still going strong, so who's to say. Of course, George Burns made it to 100, but I think he stopped acting at the tender age of 98. Overview Cracking Up is a crazy quilt of sight gags, one-liners, caricatures, slapstick and quirky vocal mannerisms. In short, it’s marvelous mayhem of the kind which has gained Jerry Lewis admirers the world over. Lewis plays a hapless misfit who seeks psychiatric help after bumbling a suicide attempt. His shrink sessions reveal a flashback history about a klutzy childhood and a family history of (what else?) ineptitude, affording Lewis to play a smorgasbord of roles, including a 6-year-old boy, a 15th-century coachman, a good-ol’-boy sheriff and a bearded guru. The wackiness soars to new heights when our nutcase patient takes a transcontinental flight on the cheapest airline he can find. But there’s no scrimping on the laughter. Cracking Up is zany proof that nobody does funnymaking filmmaking better than Lewis. 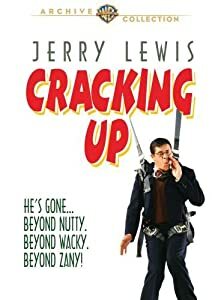 After watching Cracking Up my conclusion is that I haven't aquired enough of a taste for Jerry Lewis, or I wasn't as much in the mood as I thought. I just didn't find Cracking Up all that funny. Yes, it does have some funny bits, but in typical JL fashion he often milks them far too long. The film doesn't really have much of a story, it's basically a number of skits tied together with a flimsy frame story. I guess this film was an attempt to re-ignite a career that was going downhill. Cracking Up was preceded by duds like Which Way to the Front, Hardly Working and Slapstick (Of Another Kind), not to mention The Day the Clown Cried, which apparently was so bad that Lewis refused to release it, and doesn't even want to talk about it. Well, I guess that Cracking Up is a step up from those films, but not a huge step. Overview The Tower is this year's visually stunning, high rise rollercoaster. 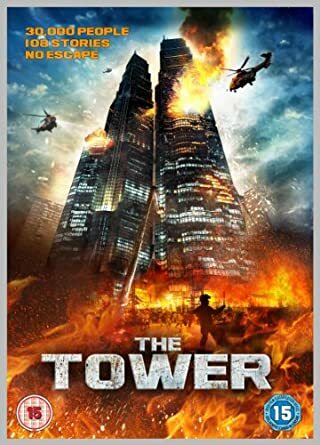 When disaster strikes at the top of a 108 floor skyscraper, the lives of thousands are put in danger. Faced with catastrophe, the city's fireman must overcome the odds and find a way to safety for those trapped. As chaos reigns and the building nears collapse will the ultimate sacrifice have to be made…? My thoughts What do you get if you take The Towering Inferno, add some World Trade Center, spice it up with lots of CGI, and move it all to Korea? You get The Tower. But is it any good? Well, some people think so. Personally I feel about the same as when I saw Peter Jackson's take on King Kong. Too much of everything. Why? Because they can. It's well done, though. So if you like lots of CGI and lots of mindless action, this is for you. Me, I would have prefered more originality and less of everything else. Not bad, but not quite my cup of tea. Personally I feel about the same as when I saw Peter Jackson's take on King Kong. Too much of everything. Why? Because they can. I just rewatched Peter Jackson's King Kong the other day. That film, is not aging well at all. At first viewing one is pretty much in awe of the high level standard of the special effects (which also age surprisingly bad), but latest at the second viewing it comes down to the film itself. I just rewatched Peter Jackson's King Kong the other day. That film, is not aging well at all. At first viewing one is pretty much in awe of the high level standard of the special effects. I wasn't, in fact I was bored to death. Common even King Kong 76 is more entertainning than that overlong film. Trade it for Tromeo and Juliette, so at least I got something 200 times better for it... I even think that Pete never watch it and that trade was four years ago. Obviously not, since IMDb is a 100% subcompany of Amazon. I'm just not sure who is providing whom with data. Overview After 10 years in prison, Driver (Dwayne Johnson) has focused on one thing – hunting down the people responsible for brutally murdering his brother. Now a free man with a terrifying purpose, he sets out to find and kill all those on his list. But on his heals are two men who will do anything to stop him – a veteran cop (Billy Bob Thornton) and a hitman (Oliver Jackson-Cohen) who finds his match in this worthy opponent. Now, the hunter is also the hunted. My thoughts Like many of today's action stars, Dwayne Johnson is not much of an actor. But then again, films like Faster don't require a great range of emotions. Actually. it basically just needs on - hate. And Dwayne does that OK. The story is pretty simple. "The Driver" (Johnson) wants to hunt down and kill the gang that killed his brother. He also wants to find the as yet unknown man who put them up to it. That man has hired a killer to stop The Driver. Films like this needs a balance. The reveal at the end - who the top man is - shouldn't come totally out of the blue. But on the other hand it shouldn't be so obvious that it totally ruins the surprise. The director doesn't quite pull this off. The hint is not subtle enough. The films isn't just mindless action, though. Billy Bob Thornton does quite a good job as the drug addicted cop on The Driver's tail. Jennifer Carpenter has a small role, but even that is too much for me. I just don't like her at all. She had some good moments in Dexter, but not here. So, all in all a fair action/revenge movie that didn't quite work for me. Reality TV? Go wash your mouth with soap, David!